This Drinique Elite tall 14 Ounce plastic tumbler gives you the look and feel of premium glassware, but they are actually made from unbreakable Tritan copolyester plastic. Tritan has the clarity of glass and is BPA-free, shatterproof, stain resistant, and odor resistant. The Drinique manufacturing process and design makes our plastic drinkware virtually indestructible and we back up that claim with our lifetime guarantee against breaking and cracking. There's no comparison to the acrylic or polycarbonate glass we've all had to replace after just a short time or a few trips through the dishwasher. In fact, if you're feeling a little low, stand on one, Yep they're that strong! the classy and stylish Drinique Elite collection of plastic tumblers are perfect for any setting and are dishwasher, microwave, and freezer safe. 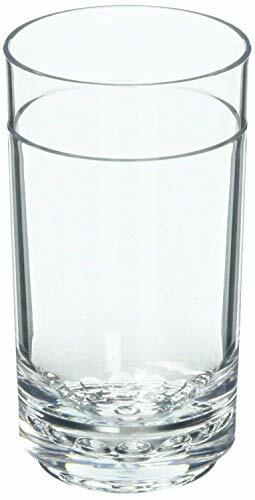 Drinique Elite tall tumbler glass holds 14 ounces of your favorite beverage. All Drinique drinkware is made in USA. If you have any questions about this product by Drinique, contact us by completing and submitting the form below. If you are looking for a specif part number, please include it with your message.